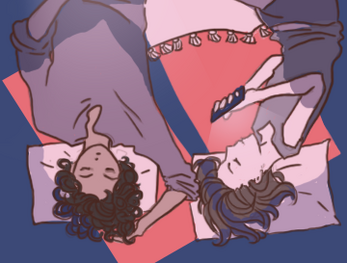 A game about laying in bed with your best friend and making major life decisions. Conversation flows from discussing mundane things to making big life changes. What you say will change the course of your future. Code and art by Rosa Carbo-Mascarell. Built on Nicky Case's Coming Out Simulator. I enjoyed this game a lot. I think it made good use of the tension of me wanting to steer the conversation so that the characters could speak their minds and sort out their problems openly, but the characters not being able to be so open so I have no obvious choices left. Life choices happening unexpectedly out of response to the least significant seeming dialogue also really played into this tension for me. I felt the atmosphere of having anxieties about your current life, and feeling trapped because of it, even when you're supposed to have choices. By the end, I felt like even if the characters opened up, they would still have to face their deeper unhappiness without any kind of clear answer or comfort. So I ended up feeling a mix of sadness and emptiness. Maybe a sense of nostalgia for when friendships were more carefree, where jokes didn't need to bury unhappiness. This game is adorable and I love it. I'm sorry I don't have any helpful comments, I just really love your game!! Ah, man! I was disappointed when it ended like that. Very cute! I was hoping an optional ending would be to fall in love and move in with your best friend. <3 Great game! Love this! A weird feeling in my chest snuck up on me as it finished... felt very natural! As a fellow freelancer, I heavily relate to the casual work dress and money struggles. Yay! Loved it! This game remembered me when I was living with my best friend :) that conversations about "everything & nothing" at the same time.